Sen. Rand Paul’s (R., Ky.) 59-year-old neighbor, Rene Boucher, is pleading guilty in federal court for attacking and breaking six of Paul’s ribs. The U.S. Attorney’s Office for the Southern District of Indiana announced Friday that Boucher is pleading guilty to one count of assaulting a member of Congress, according to the Washington Post. Authorities say Boucher was enraged and "had enough" after Paul supposedly stacked lawn waste on a pile near his yard. Previously, police have said Boucher charged and tackled the 54-year-old senator in November, and Boucher had pleaded not guilty to a charge of a misdemeanor in county court. The incident gained media attention as both Paul and Boucher provided little insight into what triggered the sudden and brutal assault. Boucher's attorney, Matthew J. Baker, told the Post in November 2017 there was no political motivation, but rather it was due to the maintenance, "or lack of it," to his properties. 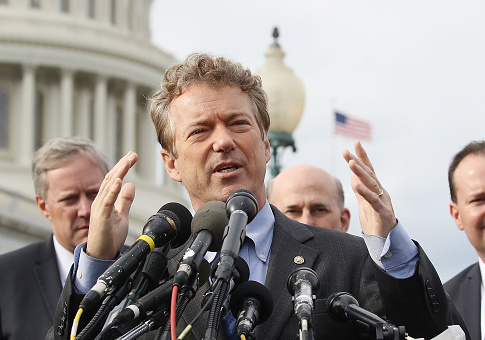 Paul dismissed the notion the motivations for the attack matter while on CBS' "Face the Nation" in January. "I think one of the things about motivations is people got obsessed, some in the media, about the motivations. But I think really we usually don’t ask if someone’s raped or mugged or whatever why the person did it," Paul said. Initially, Paul refused medical care, according to the police, but eventually was treated when the extent of his injuries became known. Boucher was charged with fourth-degree assault in Warren County. Boucher's attorney said he was "profoundly regretful" and "wishes this had never happened." This entry was posted in Politics and tagged Rand Paul, Senate. Bookmark the permalink.